For most of us, feeding our cats is a daily chore. Fortunately, it’s a pretty easy one as far as chores go. What if you travel a lot? What if your cat tends to overeat? What if your cat insists on waking you up at the crack of dawn because it wants food? Can you imagine how nice it would be to not have to worry about whether your cat has been fed? If any of this resonates with you, an automatic cat feeder might be the next best purchase of your life. Never before has modern technology made such a positive impact on the efficiency of even the simplest household tasks. These automatic cat feeder reviews will help you determine which model will be right for you and your feline friend. There’s also tons of helpful information about this type of cat product in general, which you and your fellow kitty lovers may find useful before switching dinnertime on autopilot. How Large are Your Pets? What Would be the Ideal Capacity and Efficiency of your Automatic Feeder? How Much Food Will be Needed? What are Your Main Intended Purposes for Such a Purchase? How User-Friendly is the Feeder? What Accessories or Additional Features Does the Feeder Require? How Easy is this Feeder to Maintain? For one thing, it’s powerful yet quiet—nearly silent even. So it won’t wake you up during your cat’s early a.m. meal (and neither will your cat, since she won’t need you to feed her!). This automatic feeder also can dispense dry cat food and semi-moist cat food, giving you way more flexibility. Lastly, with a capacity for dishing out up to 12 meals per day (about 24 cups of food), you’ll genuinely save a ton of time using this automatic feeder since you won’t have to refill it quite as often compared to other models! A cat feeder that dispenses food automatically should free up a lot of your time and energy. It’s an innovative product that can help you live the lifestyle you want while still giving your kitty all the accommodations and love she needs. Plus, a good automated feeder doesn’t have to be inhibitively expensive. 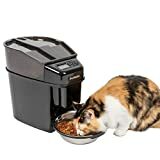 To help you find the best automatic cat feeder, we’ve weighed factors such as brand reputation, user reviews, reliability, and ease of use and maintenance to find the best possible options out there. Which should be helpful—because there are a ton to choose from. Naturally, you’ll want to make sure you’re making the best possible purchase. As mentioned, this feeder sits comfortably at the top of our list for the best automatic cat feeder. With a nearly silent motor, this bad boy churns out up to 12 programmable meals per day. Meal sizes can range from one eighth of a cup to 4 cups, doled out on a controlled timer with three different modes (immediate feed, pause feed, and slow feed, to avoid excessively fast eating and choking). The device contains an anti-jam feature so that kibble and semi-wet food can be dispensed without issue. Your cat will eat out an easy-to-clean and hygienic stainless steel bowl, which can hold a total of 5 cups of food. Complete with a locking lid feature to keep your curious kitty out of the food storage container! This feeder from WESTLINK can store up to 4 meals per day of dry food up to 1 cm x 1 cm kibble size. Simply select the portion size you want and the machine will dole it out as scheduled. It may take a little trial and error to find the right serving size for your animal since food is doled out in little portions of around 6 to 7 grams of food, but users note it works pretty consistently after initial set up. This machine uses innovative infrared technology to prevent food from jamming. You can even record a message for up to 10 seconds, giving your kitty the simulated pleasure of being “called” for mealtimes by your friendly voice! However, you might find that the message isn’t as clear as you’d like, as some users have noted. The best automatic cat feeder for your house needs to fit your home and aesthetics—and obviously work effectively. This model from the reputable pet supply company PetSafe is low to the ground and inconspicuous. Food is stored in little containers underneath a sealed lid, and rotates on a carousel feature that’s easy to clean. It’s easy to use—a plus for anyone looking for a truly convenient and efficient option. There isn’t a separate reservoir to hold extra food, however, so you have to manually refill the compartments more often. And while some users note their cats can figure out how to break into the device, most agree it’s a great option for the price. The Feed and Go is one of the higher-tech options we’ve found, but don’t let it’s fanciness fool you. Users love how easily they can program their pet’s feeding schedule and even assign different “profiles” for different animals. A built-in webcam features allows you to keep an eye on your little one when you’re away, and thanks to its wireless capabilities you can even schedule and adjust your pet’s feeding from your smart phone. That said, some reviewers express frustration over the device frequently disconnecting from WiFi. This could be due to the device or your home’s WiFi connectivity. Like any digital device, you may need to prepare yourself for the possibility of unexpected downtime. Last on our list is the Sureflip SureFeed. It’s a lot different compared to the other options. 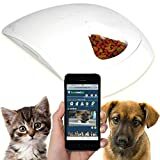 The main reason is that this product can actually “recognize” your pet as it approaches the feeder, thanks to the activation of a microchip in what’s called a RFID collar you put on your animal (it can also recognize your pet’s implanted microchip device if it has one). Once the machine recognizes the cat’s microchip, it will release the specific dose of food programmed for that animal. This is ideal for households with multiple pets who try to steal each other’s food! Some users have reported some troubleshooting issues, including the feeder opening around another animal when it shouldn’t, but overall the feature offers a lot of peace of mind. While a little on the tall side, the Surefip is a lot lighter so may be easier for some older users to handle and clean. 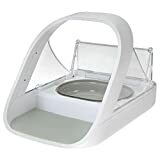 THE SUREFLAP SUREFEED MICROCHIP PET FEEDER is bundled with an eOutletDeals Pet Towel. WORKS WITH A PET'S EXISTING IDENTIFICATION MICROCHIP or RFID collar tag (one tag included). Maybe you’ve never considered getting something like an automatic cat feeder for your pet. Maybe it strikes you as a little too techy or gimmicky. You may be tempted to write it off as some unnecessary indulgence. Maybe your current routine is fine—or at least not inconveniencing enough to change anything about it. Your cat requires feeding at specific intervals or times throughout the day. Your cat is unable to be a free-feeder, since she’ll overeat if given the opportunity and be at risk for obesity. Your feline is a picky and finicky eater and doesn’t eat food that’s been sitting out for a long time. Your animal wakes you up before the sun rises because she wants to eat. You work long or irregular hours, which makes feeding your kitty at regular intervals difficult. You don’t live with anyone who you can depend on to help feed your kitty on time. You like the freedom to travel and go away from your home, while your cat can be safely alone for brief amounts of time. Some or all of these may apply to you! Likewise, there may be other factors in your life that pique your interest in such a purchase. Whatever your reasons, a automated feeding device is likely to be a super simple and effective solution for you—the perfect purchase you never knew you needed. If you have multiple kitties, you may want to consider buying multiple automatic feeders. This is to avoid any over-aggression and fights over mealtime food availability. Obviously, this is a factor to consider, given that automatic feeders are a little pricier than the non-automated alternatives. It’s important to feed your cat the right amount of food so she has energy to grow, play, and live a long healthy life. How much to give her? This depends on things like her size, age, and health status. Proper portion control is especially important if your animal is overweight. and automatic feeders can truly help with this. Many come with timer options, so your pet gets the exact right amount of food at the exact right intervals. An automatic feeder also needs to be large enough to store and dispense the right amount of food that your pet will need for ideal health and lean body weight. So, getting a small machine with a large cat or multiple cats may not be sufficient for your pets’ needs. One of the whole points about getting an automatic feeder is that you won’t have to be as directly involved in the process as often as before. But of course you’ll still have to refill it every now and then. The question is how often you want to be doing this. Selecting a large capacity feeder will alleviate the number of times you’ll have to refill the device. This may be particularly beneficial for you if you have a larger cat who needs to eat a lot, or if you have multiple pets and you elect to only use one feeder. The type of food you give your cat will also influence how large of a device you get. 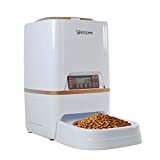 Dry kibble will keep longer in an automated cat feeder compared to semi-moist food, which many feeders can accommodate (although it’s important that the container offers sufficient seal for longer freshness). An additional factor about the efficiency of the machine is how large the kibble is that you give your pet. You’ll want to make sure that the size isn’t too large to fit through any feeding pathways or conveyor systems. The best automatic cat feeder for your animal will offer a portion control option that’s appropriate for your cat’s nutritional needs. So, when considering a feeder for your home, be sure to note the variety of portion sizes the model offers and how easily that can be accommodated for your cat. If your cat tends to gobble down her meals too quickly, you might also want to consider if your feeder has the option to dispense food slowly to control the speed of eating. No matter how much food your automated feeder holds, you’ll want to make sure that you choose a product that won’t be opened into easily by a curious furry feline! Why does an automatic cat feeder sound appealing to you? Is it for convenience? Help with managing your cat’s feeding style or weight? Simply asking yourself these questions may help you decide which model is a best fit for you and how much money you’re willing to put toward the purchase of one. Can you relate to this? You buy a new product that has some fancy gadgets and features, but they’re so confusing that you end up not using half of them or even avoid using the device at all! Know your comfort with technology before purchasing a kitty feeder. You’ll want to be able to operate it daily without feeling confused. Does your cat feeder preference require a WiFi connection, or a bunch of extra devices and add-ons to work appropriately? How willing would you be to invest in the extras if it would make your product run even more efficiently? It’s “just” an automatic cat feeder—but if it truly makes feeding your kitty more convenient and controlled, then getting everything you want to make the feeder work effectively isn’t all that unrealistic. There’s no point in buying an automatic feeder if you’re not going to do any routine maintenance to ensure its working properly. So, take care to ensure you’d be willing and able to do the necessary cleaning and upkeep. Automatic feeders move, make noise (albeit minimal), and in general look a lot different than a regular old kitty dish. Is your four-legged friend excessively skittish or curious? If so, she may not jive with your new purchase—either because she’s reluctant to eat out of it or because she spends too much time trying to break into it! You love your kitty for her individual personality. So be sure to reflect on that before deciding on the model you want! So: you’ve selected the right automatic feeder for your little one. Now what? Read the instruction manual before set up! It will contain safety information and other helpful tips, including the customer service number in case your device malfunctions for any reason. Put the feeding device on a flat and sturdy surface. This prevents accidental tipping and helps ensure the food is dispensed properly. Clean your feeder as needed or instructed. This prolongs the longevity of the device, prevents harmful bacteria or mold build-up, and keeps your kitty safe (not to mention smells to a minimum). Check to make sure if your feeder has dishwasher-safe parts, or hand wash. In addition to any routine maintenance and refilling, be prepared to periodically check the feeder to make sure there aren’t any blockages, which could damage your machine and inadvertently cause your cat to miss meals. Make sure you fill your feeder with the right kind and amount of food. So, is it time to level up your feeding game? If you’re a kitty owner, an automatic cat feeder may be an ideal solution for your household, and selecting the right one that will be the best fit for you and your cat will help you make the most out of this innovative appliance. So be sure to keep these reviews handy when selecting your own, and pass them along to help out another cat-loving friend.